You can download a pdf version of this newsletter from //news.scubatravel.co.uk/scuba-news171.pdf. SCUBA News is published by SCUBA Travel Ltd.
Should you wish to cancel your subscription to SCUBA News, you can do so at //news.scubatravel.co.uk/news.html. I wonder if you can help to promote this years Scuba Challenge which is raising funds for Disability Awareness Day? We have added 2 deep open water dives to the 64 length scuba challenge, the open water dives will take place at Capernwray (in the UK). This year we have 3 disabled divers taking part, two have spinal cord injuries and one has had a quadruple heart bypass. Proving the scuba diving is a fully inclusive hobby. Dave sustained a spinal cord injury whilst playing American Football and has since been a full time wheelchair user with limited use in his left arm and none in his right arm or legs. Since becoming disabled he has learned to dive and written accounts of his experiences in previous newsletters. To take part in the challenge (for both able-bodied and disabled divers) or donate contact dave.thompson@5bp.nhs.uk or visit https://www.justgiving.com/scubachallenge2014/. In the last issue we had a lovely letter from newly qualified diver Gillian ("Nervous Nellie") who's nearly 70 asking where to dive next. This was one of the replies. "For Nervous Nellie: Try Belize. We stayed out on the island and I did some of the most beautiful diving ever. There was a current at times that was trying if you were new but the reef was unbelievable and financially it was great." "Lots of great diving in Curacao. Tug Boat and Porto Marie were amazing. Book your diving through @thedivebus love them!" "My top 3 dive sites on Curacao are as follows: 1. Fuik bay buoy 2, Beautiful pristine coral, alot of underwater life, and alot of diversity, but you can only get there by boat. 2. Punto piku/Barricuda point, Great reef, tends to be lots of fish and turtles. 3. Playa Kalki/ Alice in wonderland great reef lots of big star coral to look under tends to have rays. For your other question their is plenty to do just depends on what your interested. Their is a big party night scene, their are plenty of good restaurants, plenty of museums, couple tourist tours, many beaches, the downtown center is nice and picturesque. People are friendly and the island is safe plus you can get everything here. ?" Around 7% of all sharks are killed every year. This exceeds the average rebound rate for many shark populations, meaning that if things don't change they are condemned to extinction. Shark products include meat, skin, teeth and oil, but it is the higher market value of shark fins - primarily in China - that has driven the demand for these beautiful animals and their population declines. However things are changing. A campaign in China to raise awareness of the effects of buying shark products has been very successful. "Demand reduction can be very effective" says Peter Knights, Executive Director of WildAid. 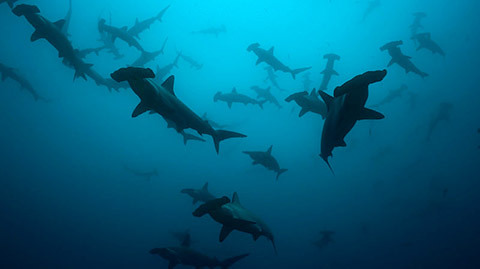 "The more people learn about the consequences of eating shark fin soup, the less they want to participate in the trade. 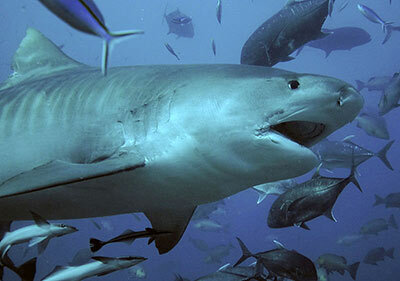 Government bans on shark fin at state banquets in China and Hong Kong also helped send the right message." In the Guangzhou markets, assumed to be the new centre of China's shark fin trade, wholesale traders are now complaining of dwindling sales and falling prices. Retailers who were selling medium-sized shark fins for as much as US$642 per kilogram are now able only to charge half as much. One Guangzhou wholesaler commented that "shark fin is a dying business" and another is quoted saying that "Yao Ming's commercial impact single-handedly smashed my business," in reference to WildAid's ongoing multimedia public awareness campaigns. Evidence of Declines in Shark Fin Demand, China, WildAid. Deep sea octopus looks after her eggs for four and a half years - breaking records for any animal's brooding period. The loss of sharks could contribute to the destruction of one of the world's most under-appreciated sources of carbon storage: seagrasses. Not that sharks eat the seagrass, but they do eat the turtles which feed in the seagrass meadows. Add this to the problems of pollution, mooring and destruction of seagrass, means this vital habitat - and the sharks - need help. Tokyo Electric Power Company (TEPCO), the embattled owner of Japan's crippled nuclear reactors, has said it is running out of space to store water contaminated with radioactive materials and is proposing to treat the water and dump it in the Pacific Ocean. The environment group WWF is calling for the creation of a whale sanctuary off the Canary Islands after Spanish energy giant Repsol announced recently it wants to start exploratory drilling for oil and gas in the region in October. Rising CO2 concentrations in the atmosphere will stimulate harmful algal blooms at a global level. This warning is issued by scientists of the University of Amsterdam, on the basis of new mathematical models, laboratory experiments and field research. Juvenile loggerhead turtles swim into oncoming ocean currents, instead of passively drifting with them. After loggerhead turtle babies leave nesting beaches, they live in the ocean for 7-12 years before migrating to the coast. The already bad news about Atlantic cod in New England just got worse. Scientists at the National Oceanic and Atmospheric Administration's Fisheries Service have found that the cod population in the Gulf of Maine is at an all-time low. Virtually every indicator of the stock condition declined in the past year, to the point that the total of adult fish, known as spawning biomass, is estimated to be just 3 or 4 percent of a healthy, sustainable population. Researchers also found very few young fish, another bad sign. A newly discovered juvenile whale shark aggregation off Saudi Arabia is giving researchers a rare glimpse into the lives of these giants. Crayfish have a "nursery" in their heads where blood cells transform into neurons - the process may one day help us to regenerate our own brain cells. The development and survival of an important group of marine invertebrates known as sea hares is under threat from increasing boat noise in the world's oceans, according to a new study by researchers from the UK and France. Eels are losing the fight to survive when faced with marine noise pollution such as that of passing ships. Scientists from the Universities of Exeter and Bristol found that in the presence of ship noise, european eels (Anguilla anguilla) were 50% less likely to respond to an ambush from a predator, while those that did had 25% slower reaction times. Those that were pursued by a predator were caught more than twice as quickly.